Evidently Our Little Game Has Changed, Yes, Tech Giant? Seeing As That You're Now Communicating With Me In Riddles. You Don't Truly Believe That You Can Outwit Me, Do You, Handsome? Do You Really Want To Do The Dozens--I Mean Riddles With Me Of All Women? Huh? Okay. I'm Game. Let's Do 'Em. . .
Oh, But Before I Get On With Mine, I Just Thought I'd Let You Know That I Received Yours Not Even Half An Hour Ago. A Living Being Who Stands Itself, Vertically Stretched And Covered In Sheer Darkness, Is The Same Consumed With A Moist, Stifling Heat - Brought On By The Guardian To A Massif Creature That Possesses The Power Of Flight. Here's Where Your Ingenuity Can Really Rise To The Occasion And Show Itself Approved. . .
. . .Mr. Silicon Valley. Ascertain My Riddle, And I'll Continue To Cherish You. . . Forever. Take Your Time. I'll Wait. . . 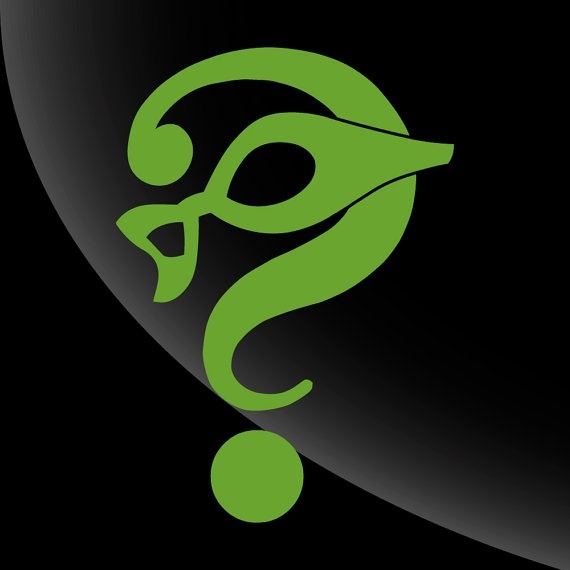 The Riddler Question Mark and Mask Art Is Featured Courtesy Of The Black Jaguar Music Company.